Kale, swiss chard, salad mix, baby kale, bok choy, spinach, turnip greens, leek, cilantro, broccoli, Korean Daikon, carrots, napa cabbage, brussels, fuji apples, beets, yukon gold potatoes, yellow onion. Last box of this winter season of shares. My potatoes, leek, and kale will go into a sausage kale soup. Blanch the mustard greens in salted water to help with bitterness to start, here’s a southern take. I’ve turned the bok choy into a slaw, quickly stir fried with garlic and then add a bit of oyster sauce, or add to make chicken soup extra healing with some ginger and tumeric. Swiss chard as a gratin. You can add the radish and cilantro to a cabbage or bok choy slaw. Small: napa cabbage, kale, radishes (x2), baby bok choy, mustard greens, arugula, pumpkin (Galeus D’ Eysines), pea shoots, red pepper, Japanese eggplant, cucumber, bitter melon, beets, spinach, onion. A couple new items from last week, pumpkin, beets, pea shoots, bok choy. Here are some winter squash/pumpkin ideas and information. There are so many radishes you could roast them, with beets and pumpkin if you want. Of if you want a salad I like to slice radishes thin with mandolin, toss with salt to wilt/take out bitterness, rinse, and mix with favorite vinaigrette. A stir fry would be a good way to use pea shoots, bitter melon, bok choy, eggplant, pepper, and some napa cabbage. Swiss chard, bok choy, spinach, salad mix, mustard greens, spinach, kale, green leaf and romain lettuce, radishes, broccoli, carrots, collard greens. 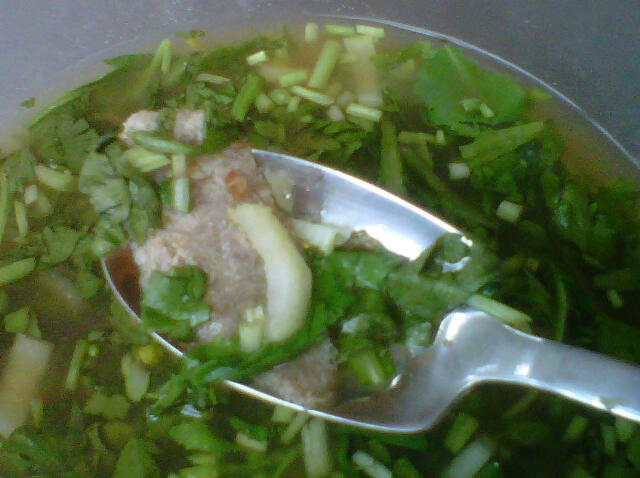 Here’s a great side using the bok choy. Small: shallot, onion, yellow wax and purple beans, daikon radish, watermelon, salad mix, spinach (x2) romain, swiss chard, black radishes, tomatoes, mustard greens, bok choi, carrots. Medium: Broccoli and broccolini, green beans, salad mix, purple ornamental cabbage, bok choi. Here’s a recipe you could use with bok choi and broccoli, I’ve always wanted to make those greens you can get at dim sum. Carrots and daikon can be quickly pickled, and I’ll be making a Korean side dish. From the kitchen of Alissa, our illustrious CSA manager, comes a fast and easy way to use up your greens. – I added ginger, but you don’t need to. I added chopped garlic and onion scapes the other day I made it. They’re good too. I was just lazy today. 4) Use a really sharp knife to shave really thin slices of the frozen meat. Set aside. 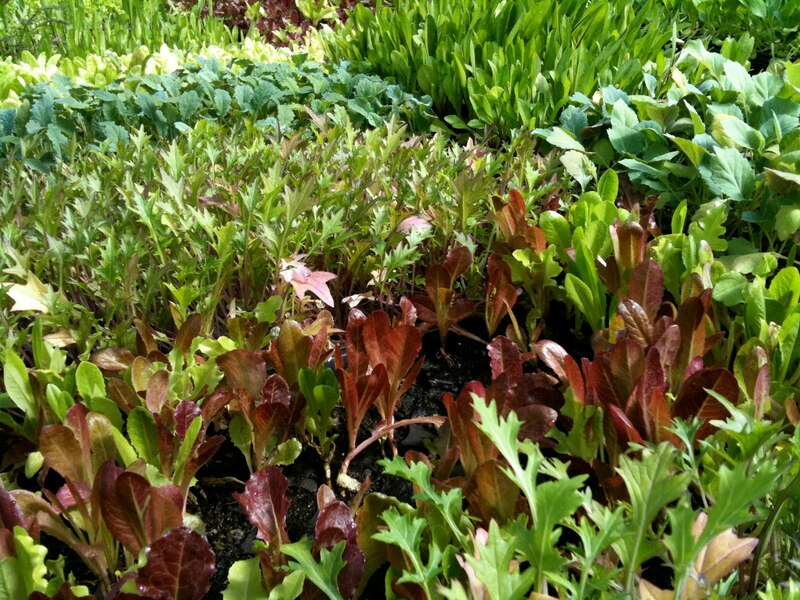 There are so many advantages to investing your time and money into a CSA. I am sure each of you have a particular reason that resonates most with you. However, there is something very different when you are given particular items instead of picking out what you would like for that week from the market. Combine that with any time constraints and all of a sudden a fridge full of fresh produce is hard to transform into something satisfying. What I try to remember when I am in the middle of my week is that with fresh sustainably grown produce the simpler the better. So…how can the food we receive in our shares translate to a simple, delicious breakfast, lunch or even food you would eat on a road trip? Here are some ideas. They are able to complement any fresh green or lightly sautéed green. Combine that with legumes or grains that you have prepared in larger portions, and you have a quick, satisfying meal. Simple Dressings: Both of these recipes for dressings are from Clean Food by Terry Walters. Compare the ingredients and notice how with only one or two ingredients, such as a different fruit juice, you can have a new dressing. Simple Dips: There are so many recipes for dips, but here are a few ideas from Clean Food. Try dipping your radishes, peas or I am even going to try to julienne my baby kohlrabi to create a dish reminscent of cole slaw. 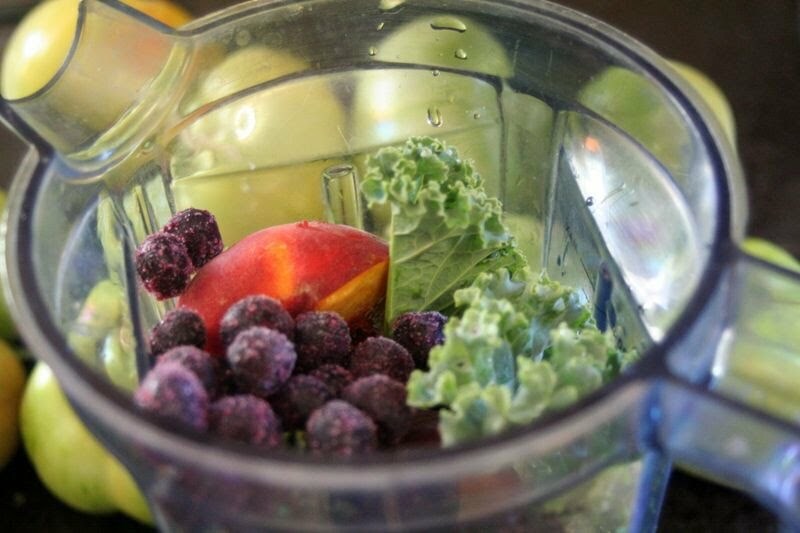 Green Smoothies: Progressive Pioneer is a wonderful blog to get great ideas forsimple yet delicious recipes. For a variation to this recipe try blending any variety of frozen or fresh fruit with some beet greens, green amaranth leaf, or Buttercrunch lettuce. If you are using fresh fruit you may want to add ice cubes or frozen plain yogurt to achieve the consistency of a smoothie. Salad for breakfast? Although I do not initially crave it, a fresh salad has always kept me satisfied throughout the morning. Experiment with different greens for your salads. Try beet greens (which are a little sweeter), cranberries, sunflower seeds and a little oil and vinegar. Or mix in a bit of your dandelion greens with some of the Buttercrunch lettuce. Adding any type of legume, nut, seed, or hard boiled egg makes it a little more filling. Sautéing for breakfast? 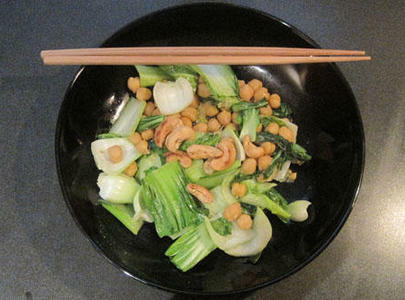 In Clean Food by Terry Walters she has a delicious recipe “Bok Choy and Chickpeas with Cashews”. Try using any of the greens we recieve in our share as a substitute for the Bok Choy. Whether it is a road trip or lunch here are some alternatives to soup, salads and sandwiches. Sushi: If you need something quick and portable for lunch why not put together a sushi roll with some shingiku or finely chopped scapes? 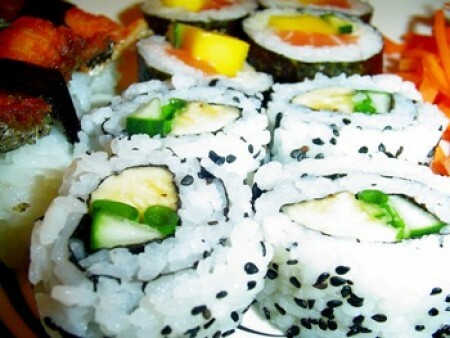 Also, instead of sushi rice try using quinoa for extra protein and nutrients. Summer Rolls: Follow the link for a vegetarian recipe for summer rolls. Terry Walters also has delicious ideas for fresh rolls in her book like “Summer Rolls with Lemon Basil Pesto” or “Pad Thai Summer Rolls with Tamarind Dipping Sauce”. My favorite part about her recipes is that her sauces do not use sugar. Wraps: Create a delicious wrap by spreading cream cheese or any dip onto a tortilla and then adding any combo of fresh lettuce, herbs, greens, and any other favorites you have like green apple slices, meat, peppers, julienned carrots, etc. Email me at produce@zoegarden.com with how you use your share when you don’t have a lot of time. What was with all of the mention of Clean Food? Not an intentional plug because there are so many books on the market for cooking with fresh ingredients, but Terry Walters has crafted a book that is rooted in seasonal recipes that offer options without sugar, eggs, dairy, wheat or meat, but are flexible enough to include those items if you choose.